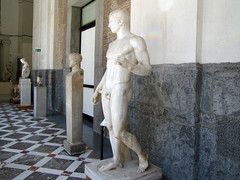 When we study ancient Greek art, so often we are really looking at ancient Roman art, or at least their copies of ancient Greek sculpture (or paintings and architecture for that matter). 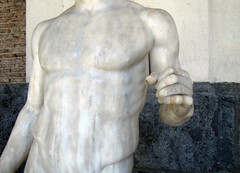 Basically, just about every Roman wanted ancient Greek art. 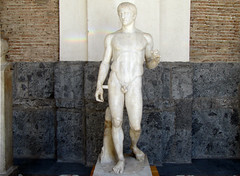 For the Romans, Greek culture symbolized a desirable way of life—of leisure, the arts, luxury and learning. 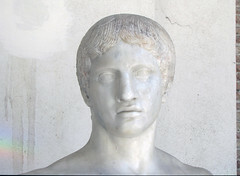 Greek art became the rage when Roman generals began conquering Greek cities (beginning in 211 B.C.E. 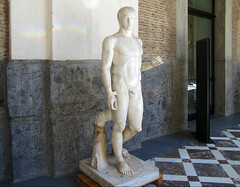 ), and returned triumphantly to Rome not with the usual booty of gold and silver coins, but with works of art. This work so impressed the Roman elite that studios were set up to meet the growing demand for copies destined for the villas of wealthy Romans. 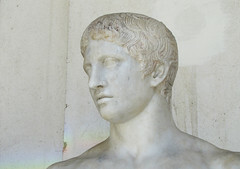 The Doryphoros was one of the most sought after, and most copied, Greek sculptures. 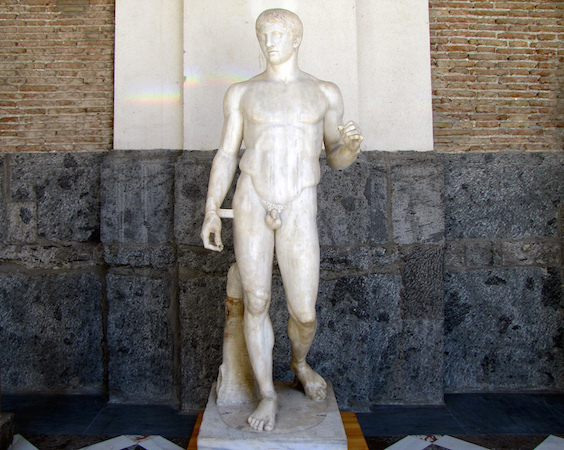 For the most part, the Greeks created their free-standing sculpture in bronze, but because bronze is valuable and can be melted down and reused, sculpture was often recast into weapons. 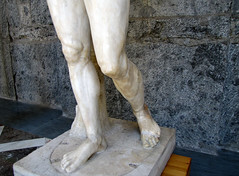 This is why so few ancient Greek bronze originals survive, and why we often have to look at ancient Roman copies in marble (of varying quality) to try to understand what the Greeks achieved. 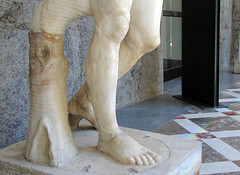 To make matter worse, Roman marble sculptures were buried for centuries, and very often we recover only fragments of a sculpture that have to be reassembled. 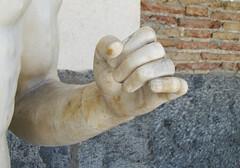 This is the reason you will often see that sculptures in museums include an arm or hand that are modern recreations, or that ancient sculptures are simply displayed incomplete. 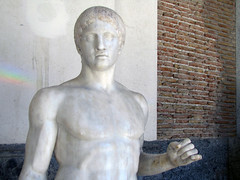 The idea of a canon, a rule for a standard of beauty developed for artists to follow, was not new to the ancient Greeks. The ancient Egyptians also developed a canon. Centuries later, during the Renaissance, Leonardo da Vinci investigated the ideal proportions of the human body with his Vitruvian Man. Beauty consists in the proportions, not of the elements, but of the parts, that is to say, of finger to finger, and of all the fingers to the palm and the wrist, and of these to the forearm, and of the forearm to the upper arm, and of all the other parts to each other. 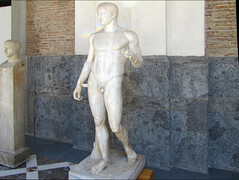 * Recent scholarship suggests that the Doryphoros sculpture in the Naples museum may not have been found in a Palestra at Pompeii. See Warren G. Moon, ed., Polykleitos, The Doryphoros and Tradition, University of Wisconsin Press, 1995. 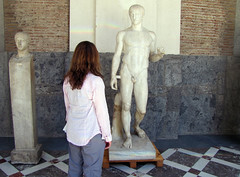 Cite this page as: Dr. Beth Harris and Dr. Steven Zucker, "Polykleitos, Doryphoros (Spear-Bearer)," in Smarthistory, August 8, 2015, accessed April 21, 2019, https://smarthistory.org/polykleitos-doryphoros-spear-bearer/.